Canada, Ontario, Sault Ste. Marie, Soo Tridents Sault Ste. We have about 700 Juniors (13-18yrs) playing in NZ Secondary Schools and about 300 Mini UWH players (9-12 year olds) playing in Wellington. Mini Tournaments are local events for Under 13's. For secondary schools we have 3 zone tournaments for the 70-80 teams that participate in the following areas- Northern (incl Mid Northern), Central and South Island held 14-16 June. The top 3 or 4 teams in each of the 4 grades obtain entry to the secondary school nationals in August each year. The grades are Junior U15 Open, U15 Girls and Senior U18 Open, U18 Girls. Secondary School Nationals is 22-25 August 2002. 40 teams attend this event each year and occasionally a visiting team. In 1999 the Ornkey Vikings from near you guys came down and played. USA, OH, Roger Bacon H.S. 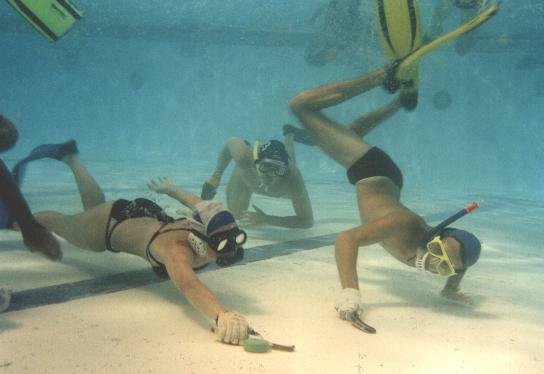 Underwater hockey is a sport played on the bottom of a pool using mask, snorkel, and fins. SCUBA is not used. A plastic covered lead puck is pushed or flicked along the pool bottom with a short stick (about 10 inches long) that is held with one hand only. There are six players per team in the water at one time and up to four substitutes, available to jump in at any time, are allowed. The playing area is roughly 25m long by 15m wide and optimally 2.5m deep. There is a goal at each end of the playing area, which is a metal trough about 10 feet across and just deep enough so that the puck doesn't come out once put in. The object of the game is to put the puck in the opposition's goal. To do this a team must work together, for one person can not feasibly score a goal alone. There are a variety of strategies and formats a team plays to be most effective. www.topica.com has a few local club mail lists. groups.yahoo.com has quite a few local club mail lists. egroups.com has at least one local club. UK players and UK-interested parties about the UK Octopushnews group, the UK equivalent of Hockeynet.The newsgroup currently has 65 members, but obviously the greater thecoverage it has the more effective it will be. However, note that this second method will only subscribe you to the mailing list and will not automatically give you access to the online calendar, file library and the various other goodies. Is only about Canadian underwater hockey. Under Water Sports in Ontario, Canada. Relevant to people inside of the province. It is intended for use with Hockey or Rugby related information. write you user name, room chat (english o español). Timing Software If you want to try it out, change your computer date to earlier than 1998, then unzip the file. Also it is not Y2k compliant, but its a simple request that the owner says he can do. Where: Texas A&M University Pools: It is a 2 playing area plus warm-up area, tile bottom, 7-9 foot deep pool. Coming mid 2000 is a comprehensive training manual from brettgrant@ AT @netscape.net the Promotions Officer of the UWH Assoc. of South Australia. Which is the better offense? An analysis of the perfect pass. When going for the goal bend your elbow so you will be able to manouver the puck. If you have a straight arm it is very easy to knock the puck off of your stick. Vary the speed of your arm movement when moving the puck. It will be harder for the defender to accuractly predict where and when the puck will be. Know where the other team is. Don't just concentrate on where you should be. "18 Minutes to Better UWH & 1999 USA Nationals"
PowerLung is a hand held device for building up your lungs by resistance training. It is like weight training for your lungs! You can change the resistance to both the inhale and separately to the exhale as you use it. The PowerLung is used by the US Freediving Team in their training and is endorsed by Spearfishing Champion Bill Ernst. sports as it may offer a some useful assistance for those struggling with bottom time. Turboswim.com"... has a Lycra like head gear that fits well and is comfortable. Their number is 1-800-808-3669 ask for Donna at ext 57. They are $20 each." Kiefer "... gear is a nylon mesh. Haven't tried them. They are $15 each." "TruWest is made from plastic coated nylon. While this might be adequate for above water activities, it seems to catch water when under it." Design Costs. Liz from Hockeynet says" Several of us recently spoke with the UK MD of Oceanic who outlined that to develop a new fin would cost upward of £1.5 million in development costs alone - thats a lot of fins!!! " High level games of Underwater Hockey are games of "maneuverability", quick changes of direction at almost non-stop pace. With this, you need "quick response time fins". You should be able to propel yourself the 'MOMENT' you think it. Longer and heavier fins tend to run counter to this objective. It is probable that in a 100 meter dash the longer fin will win, but the game of hockey is characterized with rapid bursts of kick-offs at about 3-7 meters at a time. The breakaways to the goal with an open field in front of you come once in a while. 95% of the time its a swim of short distances in different directions. Therefore, use fins that is most effective 95% of the time. : not too long and not too short either. TIP: Fin foot pocket stiffening Especially usefull on the Technisub Ala fin. A 1999 Fin comparison done by Diver Tests. They only measured thrust. The shape of things to come, split your fin down the middle. This design reduces drag more than anything thereby giving you more forward movement for the same leg work. Full footed version won't be available until late in 2001. OceanicFull footed version. I see a picture of it 3-2001. Greg McGrath bought the last ones from Mares <capeuw@ AT @aol.com> (508) 888-3444.Cost is $89.00 (U.S.) plus shipping from Cape Cod, MA. 27 pairs available as of December 2001.
quattros are better for big legs... i can get the same speed out of them as bigger guys but i only last a length at top speed before my legs give out for the next half-hour... so i use smaller fins which don't blow out my wussy legs. the cruises are identical to the quattros in design yes, BUT they are made from a different material which loses it's stiffness noticeably faster than the quattros. Technisub, Ala fins, preferred by backs. November 2002, From Hockeynet "I talked with Technisub president. I told me they are not going to produce more Ala fins, because of dioxine emissions. So, if you can buy Ala fins in UK or in Slovenia or in Germany in the past years, in the next years it will be IMPOSSIBLE. I don't know if we could buy the mould, but I know that making them is impossible because of Italian law about dioxine emissions. Doing those 250 telephone calls I discovered that you can find a lot of rubber made fins, like Rondine pro, or Rubber by Mares. You can buy them for 30 or 40 euros, ..."
Following a request from a Canadian friend and good player I phoned to Technisub to have direct informations on Ala fins for 2001. I had been told few months ago they were not going to build them any more in 2001. To order them use the email: technisub@ AT @technisub.com, but remember point 3. So, if some national groups gather, maybe it could still be possible to have them. No idea on prices, since it depends on countries, numbers made and other. Better ask them directly. TrueBlue, still placing orders for them Nov. 2003, AUD$150.00 (aussie add 10% GST) +P&P. They can be paid for by Credit Card. Zao Enterprises, ZaoEnterprises@ AT @bigpond.com.au The cost is now $120 but may rize due to supplyers increase. Dive ski, ? [a reference by Zao Enterprises]. Their cost is around $146. Aqualung, ? [I'm trying to find the distributor]. They are about 90$ US. Reef Tourers "...are pretty good. Ive been wearing them for three years now - at both club hockey at at worlds." fin so can be plastic welded. Let's face it, new fins are expensive. If you want to try something different, think about plastic welding the cracks in your old ones. I've admittedly only tried it on one brand, the Rondine Cressi-subs, but it has worked well for this brand, provided that the plastic repair guy uses shavings from the actual fin to do the welding...If the repairer uses the wroing  stuff, that does not match the fin rubber exactly in elastic properties, this can lead to the weld breaking quickly. I got another year out of my fins (no longer available in retail) by welding, and now a REWELD of the same site again seems to have taken too. Cost of welding a fin in Australia is usually $20-30 A. The reparier can usually give a you a good idea if your particular fin is made of rubber that the repairer can do something with, before you pay money to have the job done. From Hockeynet: You did not say where in the foot pocket the material is breaking or what kind of fins. If the tearing is at the toe of the foot pocket, small holes can be drilled on each side of the foot pocket in the meaty part of the fin and a nylon cord wrapped around the toe area for support so that it will not tear farther. Keep the cord snug, but not too tight or it will hurt your toes. The knot can be on the bottom and super glue can keep it from undoing. Tears any other place are very hard to fix, but if the fin is rubber it can be patched with a hot vulcanizing tire repair patch. It has been my experience that if the fin blade is tearing by the foot pocket, it is time to consider another pair of fins. Jeremy's Underwater Hockey Page, ? "The Canadian Tape Glove" humm, I've seen Rene tape his fingers directly never a glove out of tape. Dave Kennedy, USA. I started selling gloves at the Texas Open..and sold out pretty quick. I can vouch for aluminium goals also. Heavy enough to stay on the bottom (don't need lead weights like fibreglass goals), don't dent like stainless goals and are light weight to carry from storage to pool. The Charleston Club had aluminum goals manufactured for us by a vocational/trades class at a local public high school, for essentially the cost of the aluminum. The welds (or are they brazes?) are kinda sloppy looking, but they have held up very well, and the goals, although by definiiton big & unwieldy, are light (can be picked up easily by one person) and we are thoroughly please with them. I think, but can verify, that the aluminum is 1/8" thick. I have not seen a set of metal goals yet that has not got dented and unsafe to one degree or another. without lead weights as far as I know. We also have some stainless steel goals made for worlds 1992, which don't dent either...The stainless goals are in two sections which slot together so they're easier to carry around. USOA provided runs 2001 1 Aug thru 2002 31 July.Aggregate benefit is $2 million. Yearly cost will be $500 and some number of dues paying members. Platina Hyperdry(M-21) "is a piece of crap... the purge didn't work well... the purge made the mask so much higher in volume because the lenses are far away from your eyes and vision is restricted. Sealmask a low volume mask that maybe modifiable ( vinyl on the inside and outside) to make it shatterproof. relatively small knock by another players fin/elbow etc will knock the mask into the face and do dome damage. Not life threatening, but painful for a week or so." Straps -- Fasten the mask on the head with nylon webbing, like a lot of uw rugby players do. It is the best way to keep the mask in place. RenoSys PVC Pool Shells, From hockeynet: I'm pretty sure this is the same kind of lining material we have here in Denver. We've been playing on it for several years and anyone who's been to either of the first two Battles at Altitude knows what the surface is like. My assessment is that the vinyl is a slower surface than what you're used to in Gainesville (although it won't abrade and irritate your skin nearly as much as the fiberglass). You can use most pucks on it (we've used the Aussie pink, the Aussie orange, the super-soft Aussie orange, the Canadian Oreo, and the Steve Kars' Universal Puck, all with reasonable success. All the things people have been saying about pucks not sliding very well, stopping 'dead' when they hit on their edges, etc. are true, and the vinyl is definitely inferior to just about any tile bottom, but it is still far, far better than concrete. Be sure you request the smooth surface, rather than textured - we have smooth in our playing area in Denver, but the shallow end of our pool is done with textured, and it doesn't play very well at all. would be ideal. You have to hold your breath, and have patience, it doesnt write very fast, but will stay there for a month or so. Note: all this clothing runs a little large. If you are interested, please send an email soon telling me of what I should reserve for you, then send a check made out to USoA to me at: Brigit Grimm, 1031 Doeg Rd., Boulder Creek, CA 95006. As soon as I receive the check, the merchandise will go in the mail. Don't forget to give me your address. Shipping to US addresses only. For those interested, but don't need the items shipped, email me and we can work out a deal!!! Gray long-sleeved polo shirts with Team USA 2000 embroidered on the left chest ---sizes L, XL, XXL for only $16 including shipping!! Gray short-sleeved polo shirts with Team USA 2000 embroidered on the left chest ---sizes S, L, XL, XXL for only $12 including shipping!! Gray youth T-shirts with Team USA 2000 embroidered on the left chest ---sizes L, XL for only $7 including shipping!! Navy warmup pants (nylon exterior, gray flannel interior) with white stripe, no logo --size XL for only $16 including shipping!! 1998 Team USA denim pullovers left: --size M for only $18 including shipping!! Sizes: You can get Small all the way thru XXXL. Also you can get longsleeves or short. The cost for a short sleeve T is $15 and a long sleeve T $20. Order Now: If you don't care about long sleeve or the special super size shirts we still need your order so we get enough. "These are great for dry-land practice, they have about the same resistance as a puck, and will help with puck handling skills". Light weight junior pucks (800gm) Suitable for U14's. [mailto:guiceayres @ bigfoot dot com ] They are £15 each, postage was £3.32 for 1 puck at last count. REWORKING THEM from Hockeynet : Try the following: With worn Australian pucks, drill 7 - 8mm diameter holes, 4 on each side. Force a woodscrew in to make threads in the lead and fill them with hot glue or silicone. Over fill the holes about 1 - 2mm so the glue or silicone makes contact with the pool bottom. The threads lock the glue or silicone in place. Hot glue is easy to work with.This will renew the pucks ability to fly high and on rough bottom pools the puck will slide more easily. How effective this is depends on the pool bottom. As the new material wears and breaks, more must be added. On these large glass tiles, the orange (with soft coating) plays very differently from the pink puck. long shots without trouble because the pucks coating is "sticky"
easy control on stick due to "stickiness"
In general, the orange pucks favor an open game by allowing longer (on average) shots, better control and the option (if you have good aim and KNOW you won't hit someone) of shooting over a shoulder rather than just a wrist. The orange puck has a very serious handicap however. The higher shots mean that the puck is suspended in water longer and is is consequently much easier to knock down. Hence, passes are easier to intercept than the faster moving, lower pink puck. Having played a lot of games with both, I assure people that the orange puck gets intercepted on passes a great deal more than the pink puck. It is to the extent that a wise player almost never tries to pass the orange world puck past an opponent unless their stick is within 6 inches of yours. Lou Bush in Charleston SC, USA does that for their rough bottom pool. It works great! Wears well too they say. He doesn't do it commercially. "Dave Parore" pucks FROM HOCKEYNET: "...will be used at Trans Tasmans next year (2000) in NZ. A lot of people find the plastic coated pucks too light for the fast bottoms in some of the NZ pools (esp. the orange ones), so there has been a bit of a shift back to the old ones. Also the fact that "unskilled" players can get a good flick away with a sabre and an orange puck has annoyed some "skilled" players who spent years perfecting their flicks with planks of wood. I'm not sure if these are the pure lead pucks you were refereeing to, but just in case, they are still alive and flicking. Murray will then post it to the referee’s guild for discussion, Murray or his nominee will then do a summary and forward it to the senior referee’s panel within the guild. From there a definitive interpretation will come back to him which will be posted to the guild list and be sent out on other mailing lists and also returned to the person who asked the question. Car horn in a 5 letter paint tin and that works ok when half in the water. TIP: Cut the open end so that it is level with the top of you head. You will have easier breathing with a shorter tube. Mares make a great snorkel without any valves or anything on it. The mouth piece is soft rubber and has really big bite tabs. There expensive and almost impossible to find in a dive shop. I have a guy who carries Mares products special order one for me and it costs around $20. Just look in a Mares catalog, its the only one without valves on it (I think). cost about £1.50 each, in batches of 1000. Is anybody else interested in obtaining some? Just pull the plastic part off the top and it shortens it to a good length. It says it's a "New" model but variants of it have been around for a long time. If you don't want the purge, get the model down. Wrap electrical tape on your stick. Although it is not recognized as legal at the tournament level, The tape protects the wood & will last for many games, depending on the bottom of the pool. The stick inside the does not wear down at all. A roll of tape costs $1 or less & it takes all of a minute to wrap up a stick. How much more simple can you get? Some have argued that the draw back is that you get used to a certain feel then lose that feel when the tape comes off at a tournament. Perhaps, but the added bonus is that the playing areas are left with an adhesive coating that grips the puck quite nicely. Jeremy's Underwater Hockey Page ? Steve Kars stevenkars@ AT @hotmail.com "... 2 designs I currently produce, but I can make any design and I am willing to ship if you cannot make the tournament. I will also be making tape gloves for 10 bucks, and sticks are 15 cdn or 10 US per pair. Ters & Nerine are currently producing a training video for uwh. This is a professional production, not a home video, with running commentary to the different skills throughout the video. PURPOSE: To help promote hockey throughout the world, To develop skills and techniques, A tool for coaches . WHY:Nothing of its kind is available in a professional format. We are both involved in coaching in South Africa and felt that there is a huge need for a training video. FORMAT: It is a 25 minute production available in VHS format, with both PAL (European) and NTSC (US&Canada) colour systems. Commentary is in English. A booklet with a description of everything as well as some graphics will complete the package. in the USA; CROSEUSOA@ AT @aol.com, cost is $30 including shipping. The beginning is the film is repetitive playing of deck and water drills. The 2nd section shows how to practice to get a 7 foot pass. The rest of the tape (1:40) is edited games from the A Division 1999 USA Nationals. All the dead time between points and penalties have been removed so you get to see pure playing. The quality of the game is excellent. You get to see how really good players control the puck, pass and play positions. Total time is 2 hours, VHS with NTSC encoding. 1998 video tapes All Highlight's tapes NTSC and PAL format's are just $15. For more info, see http://www.patpix.com/ or email Pat at patpix@ AT @patpix.com. Wall Street Journal, June 18, 1999, "A Long Tie-Breaker in This Game Can Really End in Sudden Death"
April 27 - 29, 2001. I have put together four generic A4 posters to which club and contact information can be added in the blank spaces. They can be found on the B.O.A. web site at: http://www.britishoctopush.org and then clicking on "Publicity Posters" in the "Member Services" section. The posters are in Adobe Acrobat format, and the summary page also contains a link to Adobe's web site, from which readers for a number of different platforms can be downloaded. I hope they are of use to new and existing clubs; any further ideas welcome. Press releases - Courtesy of Big Jim - One of the best ways to get free publicity it to write you own article, supply pictures and send/e-mail it to every publication in your area. There are so many ad type papers these days that are understaffed that they will often print your article as submitted. Get a catchy headline like "Extreme sport, extreme fun" or "A new zero gravity sport in town". Make sure you include a contact name, phone number, fax, e-mail. Label it "press release" announcing your new team. After an article is printed, copy it and go to every pool and dive shop and ask to post the article. Include little tear off slips with your psoting so folks can stick them in their purse or wallet. Make sure you check regularly to see if its still up. Folks often complain that silly articles are written about their sport. This is one way to get positive publicity. This really does work! Remember to make new folks feel really welcome. Have an education/training time. Use a lots of positive feedback and hide your the super competitive types. Organize a Club, This is how the Wellington Underwater Hockey Association does it. In five years Calgary will have a core group of 30+ players compared to our core of about 10 right now. This is completely because of our junior program. Not only that, but we will have 20 or so twenty year olds with 6-8+ years of experience already. cents/hour, but hey, you aren't doing this for the money). We run 3 three month programs from September to June. Put up posters in the local swimming pools, notices in every community bulletin and throw in a demo round about mid august at a local pool with lots of kids for two hours on a busy weekend afternoon and you should get enough. We run with a target of forty kids per pool session. About 30 show up on every night at this rate giving you 4 good sized teams. You will need 1 coach per 8 kids in the water and 1 organizer. Target ages 10-14 to start. They are the easiest to recruit and relatively good at staying on task without needing a high number of coaches shepherding them. Our program started like that just three years ago. This year we had about 70 youth from 8 - 17 years old play on two different nights (8-14, 14-18). We are currently driving towards a goal of 120 youth for September plus our high school outreach program that is taught in regular phys-ed classes. Start small, get parents involved and set up a reasonable growth program. Try asking other youth sport groups in the area how they fund raise and you might find something good to help out with money. That means that the club can start to cut player fees and attract even more players. Send Comments or Suggestions to me.